Step 2 Trim the dried ends of the mushroom stems and quarter the mushrooms lengthwise. Heat the oil in a medium skillet over medium-high heat, and when it's very hot, add the mushrooms and sprinkle with one-half teaspoon salt. Cook, tossing frequently, until the mushrooms give up their moisture, 3 to 4 minutes. Add the garlic and keep cooking, continuing to toss to prevent scorching, until the mushrooms are dry, another 3 to 4 minutes. Step 4When ready to serve, stir in the red wine vinegar and toss to combine. Adjust the seasoning, adding more salt and more vinegar as needed. Mound the grain mixture on a platter. Arrange the red pepper strips casually across the top. Sprinkle with the crumbled feta and then the remaining chopped dill and serve. This makes about 4 cups of salad. In Recipes-list.com we have selected the most viewed recipes from category - Healthy eating Salads Vegetarian . Enjoy the best recipes specially selected for you! 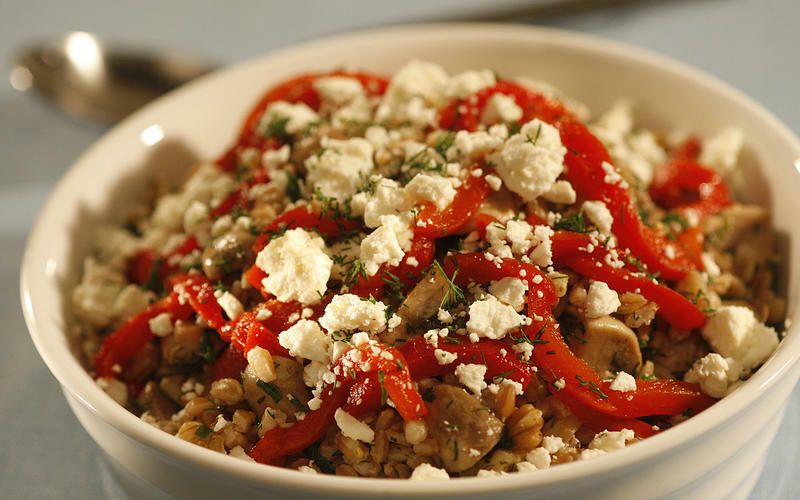 Farro salad with mushrooms, dill and feta is the right choice that will satisfy all your claims.